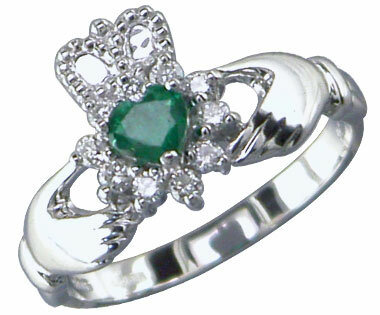 The Claddagh ring is a traditional Irish ring given as a token of love or worn as a wedding ring. It is an heirloom in the family transferred from the mother to the daughter who is first [to be] married, and so passes to her descendants. The ring worn on the right hand with the crown turned outward reveals love is being considered. I have readabout a a celtic mythological meaning that sayd The Dagda, the father of the gods ,some say, represents the Right hand of the Claddagh ring. Then there’s Danu., the ancestral and universal mother of the Celts, who supposedly represents the Left hand of the Claddagh ring. The heart represents the hearts of all of mankind…and also represents that element which gives everlasting music to the Gael. 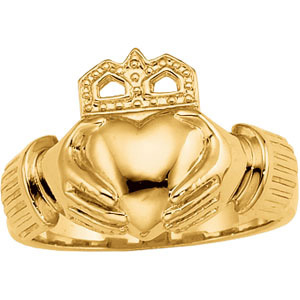 On modern symbolism the Claddagh’s distinctive design features two hands clasping a heart, and usually surmounted by a crown. The elements of this symbol are often said to correspond to the qualities of love(the heart), friendship(the hands), and loyalty (the crown). The expression which was associated with these symbols in the giving of the ring was: “With my two hands I give you my heart, and crown it with my loyalty.” Yet, the expression, “Let love and friendship reign forever” can be found as another meaning for the symbols. It was in the latter half of the year 2000 when I had the chance to contact Linda Slater, a kind lady who carried an unofficial FAQ recognized even though by Quinlan Road since she was a member by those days of “The Old Ways” e-mail list, … by the way, if you are not willing to read this post, I am pleased to inform you that Loreena McKennitt doesn’t have any pagan believes at all! “[At this point, let me hand it over to Dave Gosselin who knows much more about Paganism than I do for the next couple of paragraphs. LGS ] Let me address two issues before the question of whether or not Loreena is a Pagan gets answered: What is Paganism, and Why would one even ask if Loreena McKennitt is a Pagan? When we speak of Paganism, with a capital “P,” we are talking of the Neopagan community which is basically the magical religions which have seasonal celebrations. This is slightly different than the dictionary defmition of paganism, which is religions that are not Christian, Moslem or Jewish. There are many different traditions (“denominations” if you will) within the Neopagan community. The most widely known are Wicca and Druidism. The adherents of Paganism have seasonal celebrations at the Solstices and Equinoxes as well as the cross quarter days (the days half way between the Solstices and the Equinoxes). Most Pagans use Magic as part of their rituals. One of the most important Pagan holidays is Samhain, also known as Halloween and All Soul’s Night, at which time Pagans (and Christians, influenced by this tradition) honor the dead and attempt to communicate with them. Samhain (pronounced sow- ane or sow-een) is also the Celtic New Year. 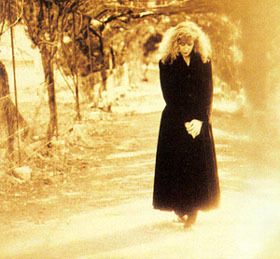 So why would someone ask if Loreena McKennitt is a Pagan? She did the music to three very important Pagan-positive films by the NFB, (The Goddess Remembered, The Burning Times, and Full Circle). There is also a great deal of Celtic imagery in her music, and Pagans rely heavily on Celtic traditions. The tilles of many of her songs use ñames that are Pagan Holidays or images. These include, Samhain Night and Hurón ‘Beltane1 Fire Dance (Beltane is considered second in importance only to Samhain in the Pagan community), All Souls Night and The Oíd Ways. The Old Ways is a synonym for Paganism. There are also a few songs that invoke Pagan sympathies due to their environmental tone, or magical vision, such as Bonny Portmore and Courtyard Lullaby. Thanks, Dave! Back to me for the rest, but before I proceed let me just say discussing somebody’s spiritual beliefs is a tricky business and whenever one does it, one has to admit they are treading on thin ice. Rumour #2. 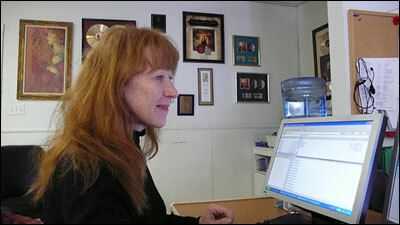 Loreena is both a practising Pagan and a practising Román Catholic. 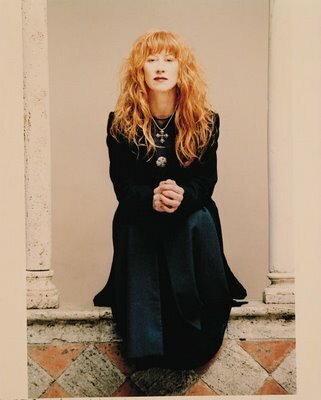 The latter rumour started a movement among a certain Pagan group to boycott Loreena’s music because to buy her CD’s or concert tickets would in a roundabout way support “the enemy” (i.e. the Roman Catholic Church). BOTH THESE RUMOURS ARE TOTALLY UNSUBSTANTIATED, and there is much more evidence to the contrary. 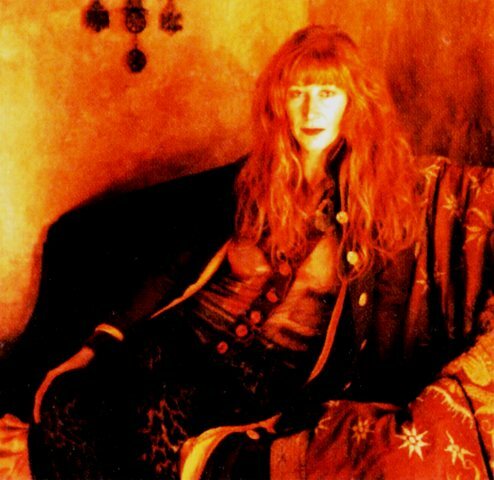 Loreena has never stated in an interview that she is a Pagan or that she participates in any Pagan religious rites. She has indicated that she knows she has a Pagan following and acknowledges that some of the images she uses in her inusic (those derived from nature or mythology) would attract those with some kind of environmental orientation to her music (and Pagans tend to have such an orientation). Loreena and her family attended the United Church of Canada (a mainline, liberal Protestant denomination) when she was young,but in reference to her current religious practices, Loreena has said that she doesn’t attend church or belong to any particular religión, but that she finds renewal in settings that bring her in closer touch to nature. Most of the time when she’s talked about religion or spirituality, she’s tended to ask questions, like “What is god?” “What is the soul?” rather than st ating what she herself believes to be true. Let me add that I myself heard Loreena say she was NOT a Pagan, and somebody else posted a message about a year or so ago saying she’d asked Loreena at a promotional appearance whether she was a Pagan, and, again, Loreena said “No”. The first live chat with fans was exhilarating for Loreena and she was astounded by the geographical diversity of participants. Members of the Quinlan Road Community from the U.S. to Turkey, and Iraq to Italy took part in the February 16 chat, sending in all sorts of interesting questions about Loreena’s travels, which was the theme. “I thought it was just fascinating,” says Loreena. “There was an aspect to this event that was like discovering many pen pals from all over the world. These chats represent another opportunity for us all to learn things from each other.” The invitation to participate in a live chat with Loreena is the latest benefit being exclusively offered to members of the Quinlan Road Community. “I have to confess that I’ve always had rather mixed feelings about the subject of merchandise. I never wanted to confuse the business – and, of course, the enjoyment and hopefully the art – of making music with the business of making and selling clothing. When we are on the road, however, particularly as we strive to continue to play in venues intimate enough to keep the experience enjoyable for you, merchandise sales become a fundamental part of financing those tours. And, trankly, they become ever more nec-essary the larger an entourage we bring on the road with us. All of Quinlan Road ‘s online orders are processed and fulfilled by our partner, the Canadian music sales company Maple Music . Their service is offered in English and French only. If you are not comfortable ordering online in English or French, see our Purchase Options page. Author, performer, and Acoustic Guitar magazine contributing editor Danny Carnahan has collected 15 of his favorite popular Irish songs and arranged them here for acoustic guitar. Many moods and subjects are covered. This large format book includes notation and playing tips for mastering fifteen of my favorite Irish songs on the guitar. The notation is clear and simple; suitable for intermediate players as well as hotshots. Click here to see a sample notation page. The accompanying CD demonstrates each song played very slowly and up to speed for students who learn more easily by ear. A speciall emphasis was taken by Carnahan on the recording of the CD wich has a very friendly way of learning. Tunes were recorded instrumental first slowly, afterwards at right tempo, and then with vocals. Each tune is accompanied with tabs and lyrics plus further backup information on the song like history, sources and even featured recordings of it. Songs are grouped in three tunings: standard (EADGBE), Drop-D (DADGBE), and the less common but wonderfully moody DADDAD. 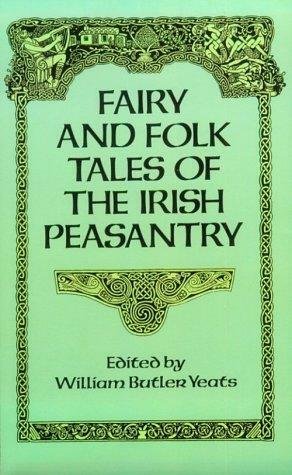 Several of the songs were personally collected in Ireland. A detailed Music Notation Key is also included to help newcomers understand all the sneaky symbols in both standard and tablature notation. There are innocent (and very old) love songs like “Rosemary Fair” and more lustful romps like “Newry Town.” There is the revolutionary fervor of “The Rising of the Moon” in contrast to the story of the poor kid who deserts after one day in the army in “The Rambler from Clare.” There is the regional pride of “The Star of the County Down” and the terrible longing for home in “Paddy’s Green Shamrock Shore.” And then there’s highway robbery, questionable job choices, unabashed love for one’s fellow man, and more. Books are available directly from Danny Carnahan. Payment by check ($9.95 per book plus $1.50 shipping – for US orders only– Please contact for shipping rates outside the US), made payable to Danny Carnahan and sent to: 725 Pomona Avenue, Albany CA 94706. Both Acoustic Guitar and Hal Leonard will be delighted to take your credit card. Click on the links in the previous sentence to rocket to their sites.